Easy easy easy... and great taste. Wash plums (do not peel), and cut them half open to the pit where they naturally have a line. 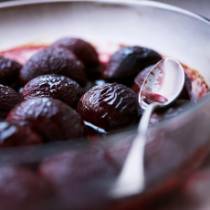 Line the cut plums up in a large baking pan with the cut sides facing up. Pour the liqueur and honey over the plums (pour inside of plums also, you may have to force them open a little). If the honey you have is a bit thick, just heat it in the microwave for a few seconds for a thinner consistency). Place the pan in preheated oven and bake for 30 to 40 minutes. Serve with cinnamon ice cream, creme fraiche, or a sauce from egg yolks and heavy cream. Only use pasteurized egg yolks. Whip the egg yolks with sugar and vanilla until very creamy (use the amount of sugar to your personal taste). In another bowl, whip the heavy cream until stiff but not grainy. With a spatula combine the whipped cream with the above egg yolk mixture and serve chilled.